At Schneider Family Dental, we utilize the latest technology in implant dentistry to restore your smile. Our name says it all. Schneider Family Dental is here to provide excellent dental care to you and your entire family. Your dentist needs to see what’s happening with your teeth beyond just what can be seen with the naked eye. Periodontal disease is another name for gum disease and, unfortunately, it is more common than you may think. If you have gum disease, can help. At Schneider Family Dental we want to see your teeth at their best. To do this we offer a number of procedures that will enhance not only the health but the look of your smile. A dental implant is a titanium post that serves as an anchor to attach a replacement crown, or tooth to. 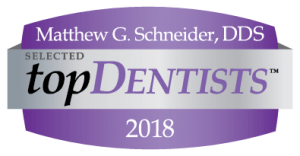 Our team at Schneider Family Dental does our best to keep you relaxed and comfortable at all times. With ClearCorrect, Schneider Family Dental offers the newest solution in orthodontics for our patients. When a tooth is broken, too worn, or partially destroyed by tooth decay, a crown or bridge is used to restore its function and health. To provide our patients with the most up-to-date solutions, Schneider Family Dental offers tooth-colored fillings. Teeth whitening can give you a bright, professional smile and can restore your confidence. As technology changes the world of dental care, Schneider Family Dental will continue to offer the best and most modern options available to you. If you have persistent migraines or headaches, one of the many potential causes may be teeth clenching or teeth grinding (also known as bruxism). Whether you’re playing football, basketball, soccer, even dodgeball, keeping your teeth safe should be as important as protecting your head or your knees.